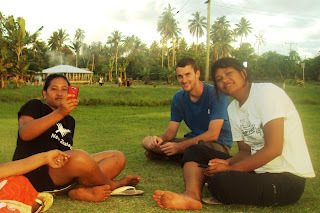 As much fun as last Christmas was in the nu’u, Group 81 has opted to spend the holiday elsewhere this year. Blakey, Erin, and I will be the only volunteers in the country, in fact. In lieu of spending the holiday there, Phil and I decided to go this week. November was a busy, and it was the first month I haven’t made it back to Fausaga since training. Phil hadn’t been back to the village since Easter. We met up at the Fish Market on Thursday afternoon and headed out. Christmas preparation is in full swing in Fausaga. Phil and I were invited to choir practice on Thursday night, and, perhaps more importantly, a truck came Friday afternoon and brought new sand for the volleyball court where the annual tournament will be held. Beyond that, things seemed much the same. 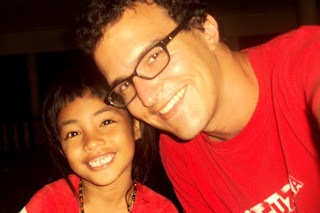 My host brother Malo and his nine-year-old daughter Aiga are staying at our house because he lost his job at the Samoa Packing Corporation in American Samoa. He and Oge have been sleeping up in the plantation to protect the taro crop from pigs and thieves. Aiga is withdrawn, but seems sweet. Perhaps because she’s the oldest child, or perhaps because she’s not Asolima’s, she seems to have Cinderella-type responsibilities. Akanese is bubbly and goofy as ever. When I handed her the bottle of coke and small bags of chips I’d brought, she offhandedly replied, “Thank you” in English. I called her out on it, and she refused to say it again. She happily repeated her old standard, “Oh my gosh!”, which is still cute, but not as much as it used to be. The baby Keleme has entered into the preliminary stages of the terrible twos. During evening prayer on Thursday night, she began ripping up pages of the book of Revelation, all Sinead O’Connor-style. So I quietly took the pages away from her. She started screaming. Mele, my host mom, had to stop the prayer to comfort the baby. She turned on the TV, and that was that. And thus I wrecked evening prayer on Thursday. I felt bad at first, but every time the baby started crying the rest of my time in the village, she screamed at the top of her lungs. Let’s hope she moves through that stage quickly. The most shocking and amusing moment of my stay came after choir practice got out on Thursday night. Asolima and Mele attended Catholic bingo, so I wandered over to see what was up. 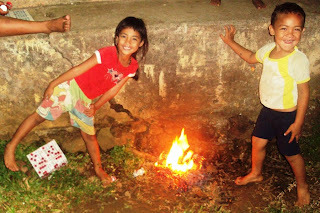 The children built a small bonfire out of bingo cards with Akanese taking the lead. She ordered the younger kids to go and collect more cards while she and a few deputies slowly dropped more cards on the fire. Asolima kept half an eye on things while she blotted the current round of bingo. Occasionally the fuel supply would run out, and Akanese would seek out Asolima’s cigarette to light the fire anew. I was mostly entertained until I imagined some kid growing up with horrible burn scars. And then I started pulling the children away from the flames. A lot more happened, but it’s difficult to capture the world of the village in one post. Maybe I’ll tell you more in the next couple days. 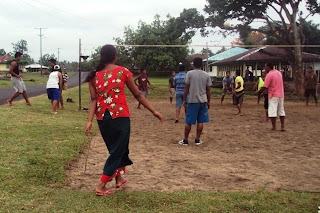 Phil's host sister Tafale playing volleyball in her puletasi. Girls hanging out on the cricket pitch. Akanese on the left, Aiga in the center. I don't know anyone else's name. Too bad she didn't burn the bingo machine. malo matt jus wanted to say danx foe lighten up dis blog.i was born hea in 1973....hope to be dere soon!FENIKA SOPI...doing tyme hea in da states kept me away all those years!! !jus venting....fa matt..